Radiant Divinities! Let us pay our devout and reverential obeisance to the gracious and radiant Spiritual Presence in whose proximity we are gathered together at this moment. May we adore the great Reality that is the one unchanging, imperishable, eternal, conscious Being that pervades and envelops all things, that indwells and sustains all beings ever since the dawn of creation and for ever and ever. May we accept the gift of this dawn hour of spiritual fellowship with deep gratitude and great rejoicing, for it is extended to us day after day, asking nothing in return except that it be utilised for our own highest good and our own supreme blessedness. And for this great opportunity to enter into life each day and rise one step higher, one step nearer the Goal Supreme, let us also be filled with utmost thankfulness, for we enter into a world which is kin to us, part of us, related to us. Each jivatma is an amsa (part) of paramatma and therefore related to paramatma. 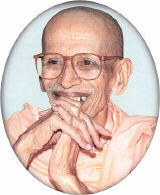 The world also has emerged out of the paramatma and is therefore related to paramatma. The relationship between man and the world is therefore sahodara (like brothers). It is the same relationship as that which exists between Kartikeya and Ganesa. Kartikeya was created by Lord Siva and Ganesa was created by Mother Parvati. We are direct amsas of paramatman, and all the universe is prakriti sambhava, born of prakriti (Nature), the outcome of God’s inexplicable, indescribable cosmic power, which Vedanta emphatically says is not different from paramatman. Great sages who had brahma-sakshatkara (direct experience of the Absolute) found that purusha and prakriti are inseparable and one; they are identical. This is the relationship between you and Nature. All Nature is kin to you. We live in a friendly world in which everything that exists is eager to assist us. Everything seen, heard, touched, tasted, smelled, thought about, imagined are all eager to help in our evolution. As a matter of fact, they are not only there to help evolution, but you have been put here amidst them in order to assist and achieve your own evolution unto perfection. Everything wishes to help us; all things are part of our evolution. If we could only see this, it would be a fascinating life-long study of how we could utilize each and everything that we encounter, from morning until night, to assist us in our evolution. This research would be never-ending. This research would be ever renewing your knowledge of the universe in which you live. Everything inert as well as alive, both animate and inanimate, will be found to have a place and a purpose, apart from their own place and purpose, in your evolution. They are there to help and assist you. They are there to make you overcome. Everything in prakriti (Nature) including yourself, your body, mind, thoughts, emotions, sentiments, actions, the sum total of your personality and its innumerable facets and aspects, all contain the three gunas. They all hold within themselves sattva, rajas and tamas. All the three gunas are indispensable; without them nothing can exist or function properly. Without tamas we would not be able to sleep and recoup energy expended; life would become a rapidly degenerating process. Rajas too has its function to perform. But then, we should be diligent and we should also be intelligent. Wisely we must know how to be helped by everything, know how to invoke the sattva within everything. You all know that food sustains life. It nourishes the body as well as the mind, intellect and our very nature, svabhava. And you know that all the three gunas are in food. It is up to you to make a beeline to sattva, to take rajas in the right quantity and to avoid tamas as much as is necessary and possible. Fire is indispensable in the kitchen; otherwise, we cannot cook food. A sharp knife is also indispensable for cutting the vegetables. And if we use the indispensable factors of fire and steel with caution, they will help us, and we will benefit from them day in, day out, year after year. They become indispensable to us; we cherish them. But unless we have been cautioned and have learned how to use them with diligence and intelligence, we will burn ourselves, cut ourselves. So there is a stage when we should be cautioned against Nature around us, cautioned against this world. But it is a stage, only a stage. It is a warped idea that we have to fight against Nature, that everything is there to torment us. If we get stuck in the idea that Nature is alien, then we lose a great gift of God, a wonderful facility afforded to us by God to make use of Nature, to utilise the kinship of Nature in order to attain divine perfection. On the other hand, if wisdom, caution and common sense are exercised, then the whole universe, everything in Nature, will be known to be your own, your kin, your well-wisher. And you will know how indispensable they are, how they are necessary, that they are put there to help you in your evolution. Nothing is inimical. You do not live in a hostile world. It is a wise God Who has created you and this universe and put you here—an all-knowing, omniscient Being. There is a beautiful story in the Upanishads about a seeker who came to a Maharshi and was assigned to do karma yoga (selfless service). Years and years go by. He never sits before his Guru, but he is taught by everything around him and shines with brahma-tejas (divine light). Without ever sitting before his Guru or learning a lesson, he becomes an illumined being, a brahma-jnani. It is just an indication of what Nature is meant to do, what Nature can do for you. So it depends upon how much we have learned the art and science of calling forth and invoking the sattva that is in everything in this universe—without yourself and within yourself. Make use of Nature, utilise the kinship of Nature in order to attain divine perfection. We live in a friendly world. We are surrounded by friendly things which are ever eager to help us in our evolution. This is the truth. Pondering this truth, one will behold the world as God, behold the world as angelic and not demonic. And it will arouse in one a great joy, a great hope, a great feeling of gratitude, a great feeling of friendliness to all life around, for all things around, animate and inanimate. For God made them all and put us amidst them. May this truth enlighten your onward march towards the great Goal!